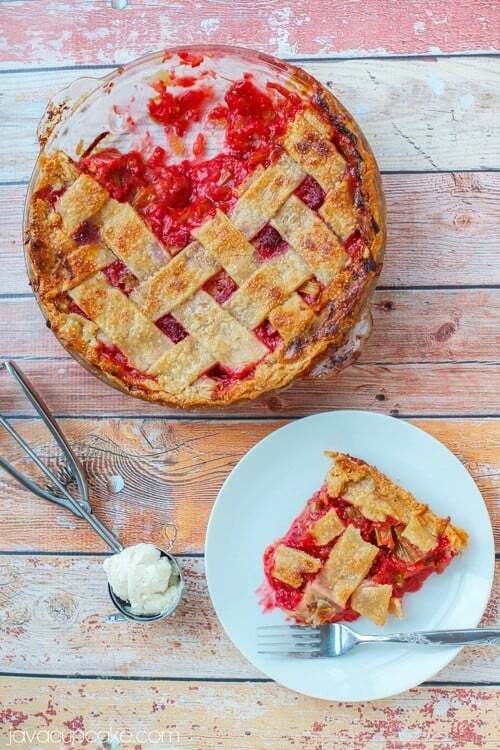 I’m obsessed with Rhubarb this season. Every time I pass it in at the market, I need to pick up at least 3 stalks of it. 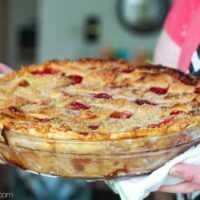 This time, I made a tart, decadent, delicious Raspberry Rhubarb Pie with a lattice crust top! To. Die. For. This pie was my first attempt at making a lattice crust top too. I posted a snapshot of it on Instagram and someone said it looked “rustic”. I wasn’t sure to take that as an insult or a compliment at first. But, I think I’ll take it as a compliment. I’m not a professional pie maker after all! My friend Ann Marie of the blog Farming Grace sent me a jar of raspberry rhubarb homemade jam last year and I fell in love with the flavor combination. I had already tried strawberry rhubarb pies and jams, but the raspberry twist was new for me. Raspberries are my all time favorite fruit and anyone that is ever at my house for breakfast will see my bowl of cereal piled high with these sweet red berries! 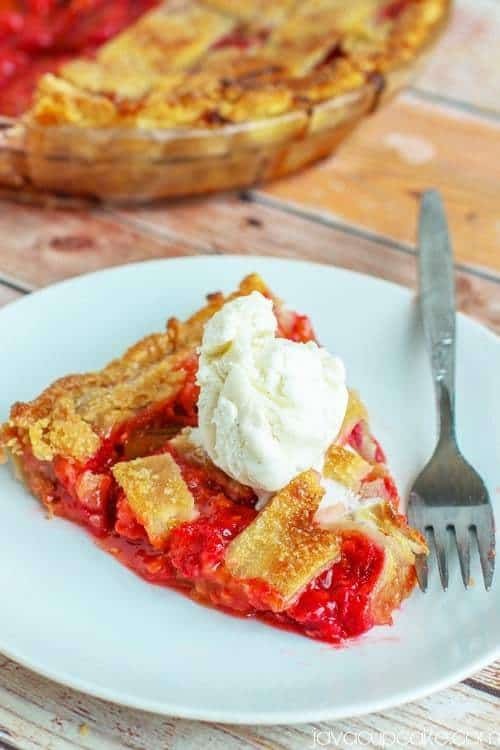 The day I served this raspberry rhubarb pie, I had over my friend Mareile and her two kiddos to enjoy it with my family. We topped each slice with vanilla bean ice cream which perfectly offset the tartness of the pie. The lattice crust was so super easy to make. I think it was even easier than trying to lay an entire piece of pie dough over the top evenly. I could adjust the pieces, move them where I needed to without worry about ruining the entire crust. I just may be making every pie with a lattice crust from now on! 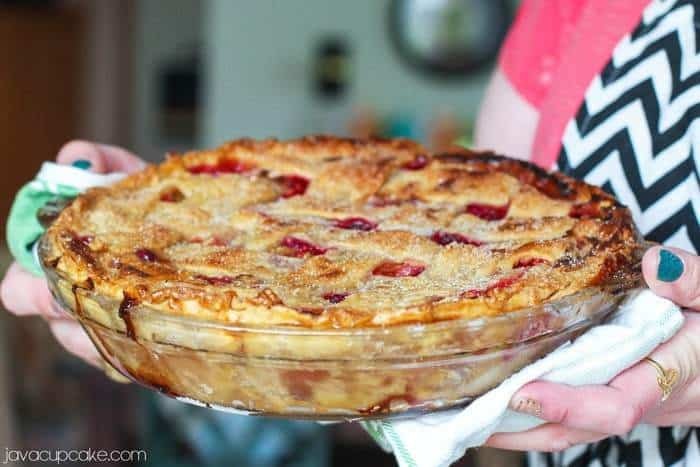 This raspberry rhubarb is my new favorite summer pie. Seriously. It’s soooo good! I really hope you make this for your family and friends! Roll out one of the pie crusts into a 9in pie plate and press up the sides. Chill until ready to use. In a large bowl, combine the cut rhubarb, raspberries, lemon zest and gently toss together. Sprinle over the sugar, flour, and cinnamon and gently toss to combine. Pour over the lemon juice and toss again. Make sure to be gentle with the raspberries so that they stay intact. Let stand for 20 minutes then toss one more time. After 20 minutes, roll out the second pie crust on a lightly floured surface and cut into 1in strips. Pour fruit filling into chilled pie dish with the crust and spread evenly. Dot the cubed butter over the top. Lay half the strips over the top using every other strip. Weave the remaining strips over and under creating a basket weave. Crimp the outside rim of the crust creating a beautiful edge. Brush the top with the egg wash then sprinkle the sugars even over the top. Cover the edges with foil and place the pie on a baking sheet. Bake for 50 minutes, remove the foil and rotate the pie. Bake another 25-40 minutes or until the crust is golden brown and the filling is bubbling. Allow the pie to cool for 20 minutes before cutting and serving. I LOVE sour rhubarb with sweet strawberries, but I have never tried it with raspberries! This sounds so good! Your pie looks amazing!!! I just knew you’d love rhubarb and raspberry once you tried it. This pie looks so good! Love rhubarb so much too – definitely one of my fave fruits! Divine recipe! I adore rhubarb, but have never paired it with raspberries. I am quite sure you wouldn’t have to twist my arm to get me to try this pie, either! It looks absolutely luscious and I’d just love to pour some cream or custard right on top! Yummy! Seriously… it’s so good with raspberries. My absolute favorite combo! 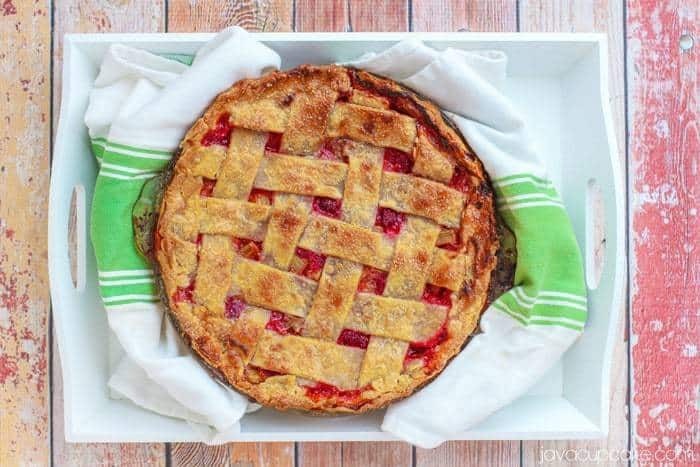 I can tell you that this pie crust looks wonderful and I envy your lattice skills! AWwwwww thanks. It was my first try! This is a great recipe! I did make my own crust, but followed everything else. Was so bright and delicious. Wasn’t feeling the lattice topping, so i just did a butter crumble. Thanks! I am excited to make this recipe but I can’t find the directions. 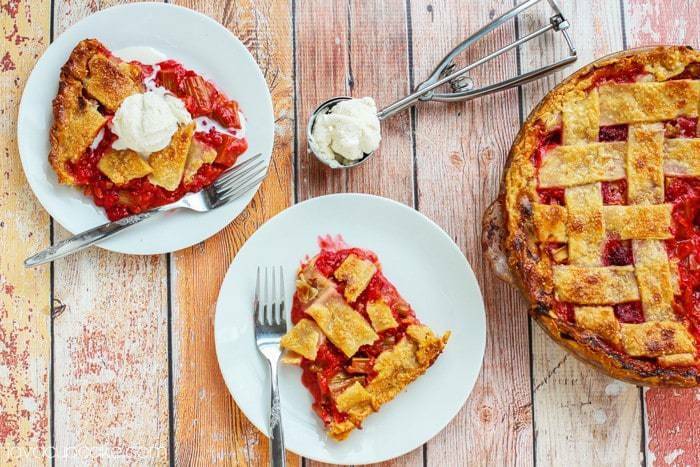 Can you post a link for this raspberry-rhubarb pie please. Sheree – I’m not sure what you mean. The recipe and instructions are included at the bottom of this post. Thanks! The last ingredient says 2 tbsp go granulated ….. I’m assuming that’s sugar? Looks fantastic. Can’t wait to try it. I fixed it!!! Thanks so much for catching that typo!